White Sturgeon caught on the Columbia River on a dead shad. 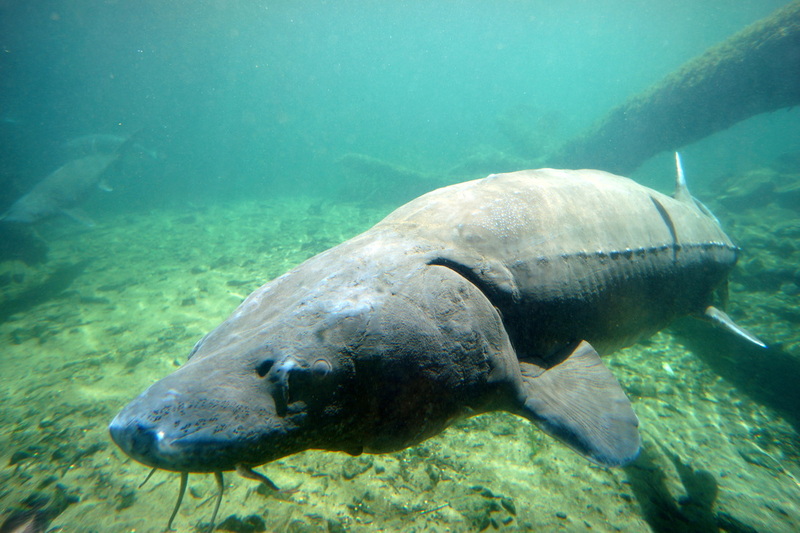 The largest freshwater fish in North America, White Sturgeon are an ancient, bottom-dwelling fish that can live over 100 years and can reach lengths of over 20 feet. They are technically classified as a bony fish but actually have more cartilage than bone and hence resemble sharks. They live in rivers and bays in both fresh and salt water along the northwest coast of North America. They have an excellent sense of smell and primarily feed on dead fish and other things that float by. They sometimes also eat crustaceans. They have barbels similar to catfish and can sense food sources both in the water and beneath the mud. Although they don't look like they would, White Sturgeon often jump when hooked. It is a spectacular sight. They also sometimes free-jump, for reasons I do not know. Mostly they sit near the bottom and wait for food to drift by. White Sturgeon are easily threatened by overfishing. As a result, there are strict size and take limits in most of the places they live. They are good to eat and their eggs are used to make caviar. When they are young they have sharp scutes along their bodies, but as they grow these get worn down and are less likely to cut you. They have no teeth and are relatively easy to handle when brought to the boat assuming they are tired. You will want to use fairly stout tackle to lift the heavy fish up in the current. They don't really hit lures, so you can use heavier rods that are more durable rather than lighter graphite since you won't be casting all day. Braided line is recommended to help drive the hook into their blubbery mouths. If fishing for large fish, 80lb braid is about right. Their eyesight is quite poor so you can use a very heavy leader. Usually you will need a fairly heavy weight to keep your bait on the bottom where they feed. The exact size will depend on the current. Scroll to the bottom for some links for tackle for these. White Sturgeon are nearly always caught on bait rather than lures. They sometimes hit salmon lures that sit in the current, but generally only if they have some sort of scent like a herring or some other baitfish attached. I'm not aware of any way to consistently catch them on artificial lures. White Sturgeon are not particularly picky when it comes to baits. Squid, smelt, herring, salmon, trout (where legal) and other dead fish will work fine. For the larger ones, it is a good idea to use a large bait. When the shad are running a nice 2lb shad makes a great bait for large White Sturgeon. Just make sure your bait stays on the bottom. 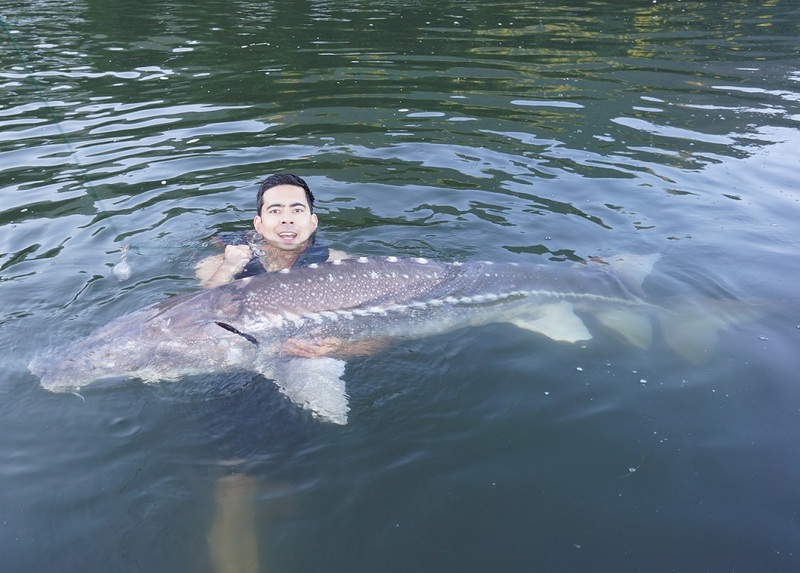 White Sturgeon often bite very gently, especially for such a large fish. They can nibble on a bait for quite a while without eating the whole thing, and will often drop it if they feel resistance. When you see little nibbles, hold the rod and wait until you feel harder tugs. Then set the hook as hard as you can, preferably more than once, and reel fast. As mentioned before, Sturgeon often jump when hooked. The Pacific Northwest is a good area for White Sturgeon, especially in the Columbia River in Oregon near Bonneville Dam. Herman the Sturgeon at the Bonneville Dam, Oregon.